Diamonds for Peace was formed in Japan in 2014 as a direct result of founder Chie Murakami’s exploration of the diamond industry and supply chain when she became engaged and wanted to find out more about where diamonds come from. Working at each end of the supply chain, Diamonds for Peace has a unique two-stranded approach, both raising public awareness about the challenges and realities of the diamond industry and also engaging on-the-ground with a mining project working to bring responsibly sourced diamonds to market. 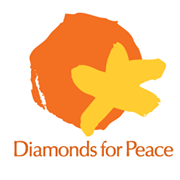 For more about Diamonds for Peace and their work you can access and download their newsletter here. You will also hear from some of the people in the artisanal mining community in Liberia where Diamonds for Peace is working to develop a better and safer working environment as well as a more equitable route to market.